Why, at the finest Taverns of course! It seems that the most dashing of Heroes always seem to start and end their adventures in their favourite Tavern! With a little gold and a lot of luck, yours could be the Tavern where the bravest and boldest of the realm gather after fair maidens have been rescued, dragons slain, or any number of wrongs righted. 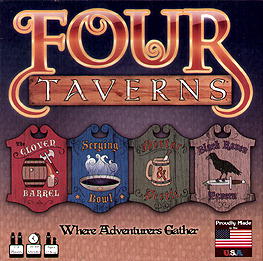 In Four Taverns you compete against your opponents to have the best known Tavern in the land. Hire Adventurers and send them out on Quests. The more Quests your parties complete, the more Adventurers come to your Tavern. However, take heed; for the other Taverns will often be playing for the same Quests you are. If they succeed where you fail, your Adventurers and gold will be lost! Warriors, Wizards, Druids, Alchemists, and Rangers. You'll need all of them and more to win.